One might imagine that sending a child to school would be a relative easy affair – provide a uniform, pay annual school fees, purchase some pencils and notebooks – sounds doable, right? However, the factors that affect this child’s success (or lack thereof) at school are much deeper and more complicated than that. Problems at home are often the root cause of poor academic performance, behavioral issues, and inconsistent attendance. Ensuring the health and welfare of families is a crucial aspect of providing educational opportunities for AIC’s students and we don’t have to search very far to witness the impact of this approach—we see it every day in students like Divya (name changed). 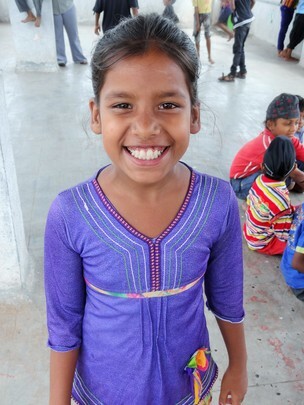 By all accounts, Divya is a sweet and fun-loving little girl. She loves studying English, excels in sports, and never misses an opportunity to participate in any shenanigans happening at the AIC Center. Her cheerfulness is so infectious that you wouldn’t imagine that she had been struggling to stay afloat at school until recently. 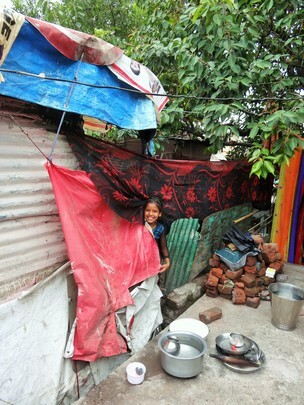 Divya and her four siblings live with their parents in one of the many make-shift housing structures in the slum made from corrugated metal and fabric. During monsoon season, unsealed, leaky roofs on these shelters lead to dangerously unsanitary conditions and a variety of health problems for the families that inhabit them. In Divya’s case, the roof was not just leaky, it was completely porous, made from layers of fabric stitched together and stretched over the metal sides of the building. Divya explained that during the rains, so much water would come in that her family would wake up during the night to change their clothes, but it didn’t help much because the dry clothes would be soaked through by the morning. Possessions, including the children’s books and school supplies, were frequently ruined. Things weren’t much better during the winter season when Divya’s family huddled together to keep warm, with no protection from cold nighttime temperatures. 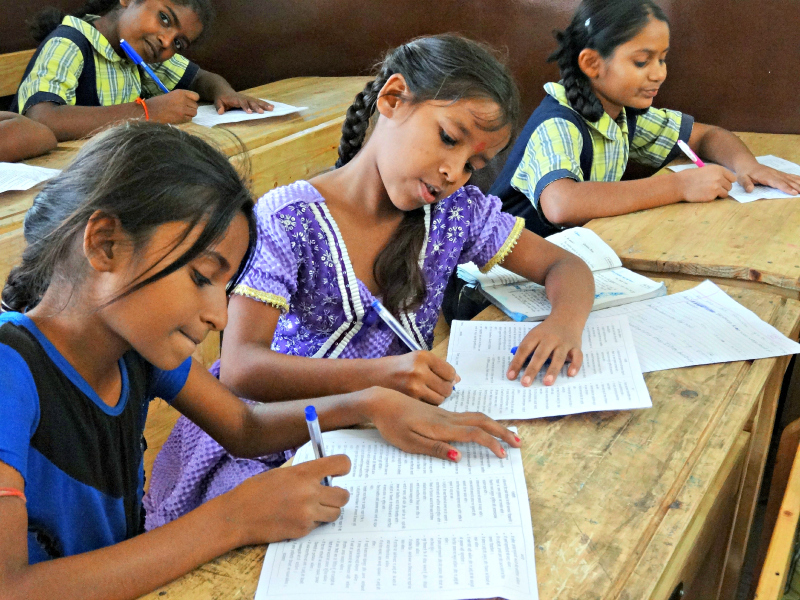 Night after night of sleeplessness caused by poor protection from the elements began to take its toll on Divya’s school performance and her teachers were deeply troubled by her tendency to fall asleep in class and resulting patterns of disruptive and defiant behavior. This monsoon season, AIC staff provided Divya’s family with a microloan to buy materials to fix the roof of their home. AIC has also taken an active role in providing counseling services and hands-on support for the family to help them improve their economic conditions and continue building healthy relationships with one another. Divya says that since AIC extended this support, the whole family is able to get a good night’s sleep, everyone is in better spirits, and arguments between her parents are much less frequent. Today, Divya is a wonderfully silly and vibrant 10 year old. She has shown significant improvement in her studies and aspires to become a teacher after college. 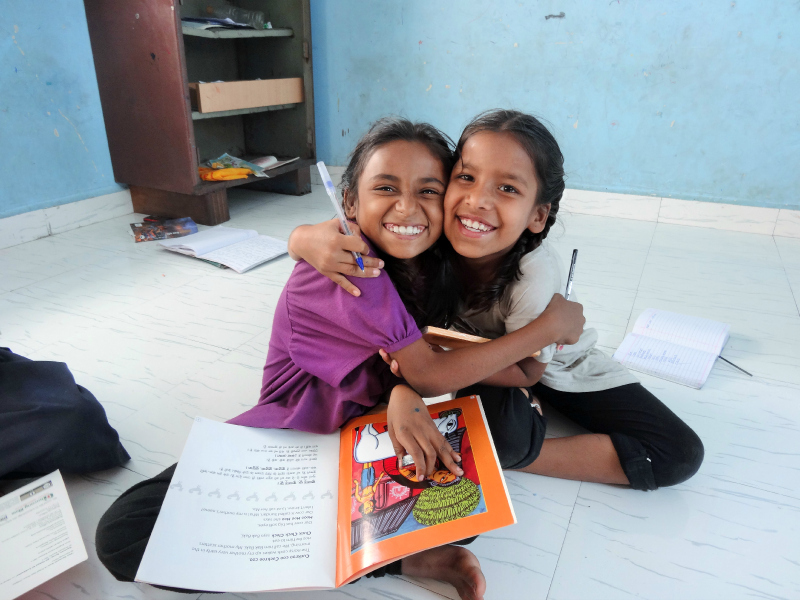 This school year, we discovered something new about Divya—she is a gifted athlete. This term, she began participating in an afterschool P.E. program at the AIC Center, and her talent and enthusiasm shone through so brightly that the coach remarked that she could be an Olympic athlete one day. True or not, Divya is more focused on playing kho kho (a tag game) and kabbadi (a rugby-type game) with her friends than training for a gold medal. But who knows—maybe one day.